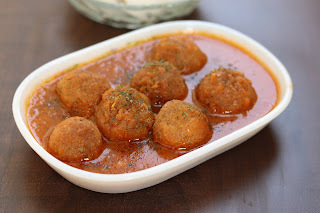 See how to make non-fried kofta recipe. 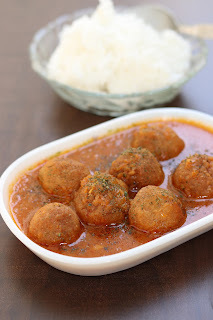 Kamal Kakdi kofte or lotus stem kofta curry is a unique curry recipe where kofta are made in simplest manner and are soaked in rich gravy. 1. Peel lotus stem pcs and wash nicely to remove all dirt. Cut it in small pcs. Chop kamal kakdi in chopped or mixer grinder. 2. Kofta - In chopped kamal kakdi, add mashed paneer, semolina, besan along with all spices. Mix nicely. Add 1-2 tsp oil in kofta material. Prepare kofta in any desired shape. Glaze all kofta with little oil. Place all kofta in preheated airfryer. Air fry kofta for 10-12 min at 180 degrees. 3. Gravy - Heat 2 tsp oil in a kadhai, splutter cumin seeds, add ginger garlic, onions and saute for 4-5 min on medium flame. Add tomato puree and cook the masala for few min and add all spices. Add curd.Mix well. 4. Cook the masala for 10 min till oil separates from it. Add water to prepare curry. 5. Once masala is cooked, add garam masala. Add kofta in gravy and cook for few minutes.